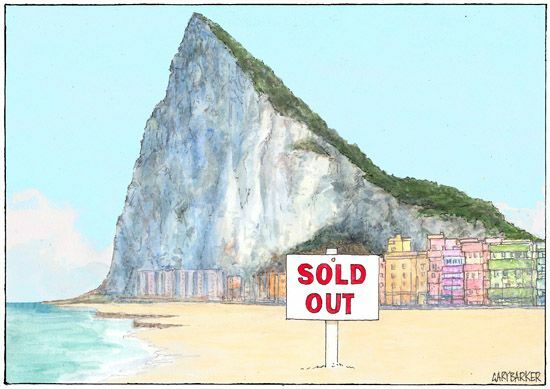 Gibraltar brexit cartoon. Theresa May and her Conservative government have toed themselves in brexit knots and the question of borders between the UK and its dependencies and the European Union after the UK leaves the EU is not least among the government's problems. While the border between the Republic of Ireland and Northern Ireland has understandibly got most of the attention, the border between Gibraltar and Spain as a brexit issue has largely gone ignored. But with almost all of Gibraltars population voting to remain the EU there are suspicions the UK government could be willing to hand over Gibraltar to Spain as part of the final brexit deal. This will of course not go down well with the inhabitants of Gibraltar as they are also fiercely loyal to the United Kingdom.